Are you preparing for the IELTS exam? Are you looking for new topics to speak about, vocabulary for each topic AND strategies to help you perform at your best? We all know that the best way to prepare for an English Speaking exam is to practise as often as possible … ‘practice makes perfect’ is particularly true for students in this situation! The question is where do you find suitable practice materials? It’s important that you’re familiar with the kind of short presentation (long turns) and discussion topics that often appear in th IELTS Speaking exam, but these can be hard to come by. And what about the key vocabulary to support these topics and the Speaking skills you’ll need to focus on? This is why we produced the IELTS Speaking Task Sheets. What are the IELTS Speaking Task Sheets? Would you like to have access to interesting Speaking topics? Would you like to learn highly-practical methods to help you develop your English speaking skills? Do you want to have access to useful topic vocabulary to use in the IELTS long turn and and discussion? That’s exactly what each Task Sheet offers! What’s in each Task Sheet? Two speaking tasks: Each Task Sheet contains 2 tasks: an IELTS Part 2 long turn and secondary Part 3 discussion questions. Task focus: The featured task comes with a task focus, offering you a memorable and practical way of delivering the task well. Topic vocabulary: Each Task Sheet comes with a list of topic vocabulary you can use in your long turn or discussion. Sample recording: Each Task Sheet comes with a link to one of our free Splendid Speaking recordings offering you the chance to hear a student carrying out a similar task with a teacher’s feedback. Can’t I just download any of them for free? 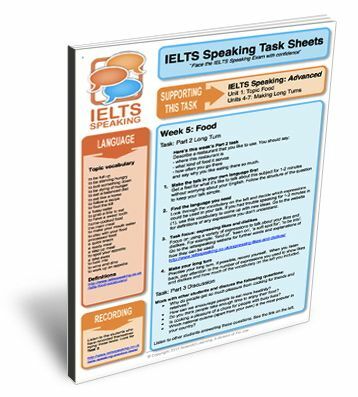 We do publish example IELTS Speaking Task Sheets for free download. However, if you prefer to have access to ALL task sheets IMMEDIATELY you can now do so. The Task Sheets are ideal preparation materials for face-to-face or online Speaking practice. Use the vocabulary list and Speaking strategies to prepare for the session and then put them into practice during your Skype or face-to-face lesson with one of the practice test tasks. How much do the IELTS Speaking Task Sheets cost?